When trying to choose the best random orbital sander for your woodworking projects, it’s important to review a variety of different factors. It has to be able to perform, quickly and efficiently, all the tasks that you will be throwing its way. For that reason, operational features like start speed, variable or fixed orbit speed options, disc-size compatibility, and motor power can weigh heavily in your decision. But, at the same time, your future power sander will potentially be vibrating along in your hand for a long time, so it also has to be comfortable to use. View the Best Random Orbital Sander for the Money, Below. Best Random Orbital Sander for Woodworking? How Does a Random Orbital Sander Work? 5 amp motor capable of varying between 7,500 and 12,000 ORBITS PER MINUTE. Features such as Bosch's pad breaking and hook tight systems combine to provide a finish free of swirl unwanted marks. Twist-Off Dust Canister easily detatches and pairs with a microfilter system to keep your work space dust free. Dual mode sanding features variable power modes that can switch between coarser and finer functions for maximum adaptability to all your wood working tasks. FastFix tool-free backing pad change system and step-less variable speed control make changing between jobs simple to do. Jetstream dust extraction system removes dust from your work surface as quickly as it creates it. Paddle switch actuation makes turning this sander on and off about as easy as it gets. Compact 5-inch size and easy to maneuver 3 pound weight make this a simple machine to operate. 2.4 amp motor runs at a single speed of 14,000 orbits per minute. This is without a doubt one of the best sanders included in our reviews. Bosch's focus on the finished product shows here, and with the ROS20VSC in your collection, it will show on your projects, too. The Rotex RO 150 from Festool is, at once, an orbital designed to tackle tougher jobs and a heavy-duty power tool capable of carrying out more refined wood work. Why choose between a sander for each job, when there's one that can handle them all? This is a great tool for the homeowner looking for a random orbital sander to smoothing down whatever rough patches pop up during your weekend home improvement projects. Built to emphasize ease of use and efficiency, this sander is an DIYer's best friend. This random orbital from Dewalt is a tool built to handle a long lifetime of wood work. A durable design maximizes the product's longevity and marries perfectly with features meant to make for a more user-friendly operating experience. Woodworkers wanting something to keep up with their workload, day in and day out, will be impressed with this Dewalt model. 3.0 amp variable speed motor is capable of adjusting between 7,000 and 12,000 orbits per minute. The Dewalt's Easy-to-control body and ergonomic design with textured grips make for comfortable operation. Dewalt-exclusive controlled finishing system helps to eliminate scuffs and marks when you're done working. Built in dust bag with vacuum adapter for use with or without your shop vac can keep your shop its cleanest. An incredibly versatile random-orbit sander, the Makita BO5041K is built entirely with adaptability in mind. Capable of being adjusted to a variety of speeds and configurations, this sander can fit whatever job you're hoping to handle. Conveniently located variable speed control dial allows users to switch between 4,000 and 12,000 orbits per minute with the flick of a thumb. Ergonomic design features a number of rubberized areas for gripping and holding the sander, depending on the needs of each task. Pad control system for more control while finishing helps to lessen swirl and scuff. High capacity, efficient dust collection system runs directly through the sanding pad. The Porter-Cable 382 is not a heavy-duty, professional sander by any means, but it also shouldn't be faulted for it. This is an ideal sander for those looking to complete fine finishing projects that come up around the home. Compact 5-inch size and light 3-pound weight design make for maximum maneuverability. 1.9 amp motor powers the 382 to run at a rate of 12,000 orbits per minute. Controlled Finishing System from Porter-Cable helps prevent gouging and swirling. This random orbital from Bosch stands apart from the rest of the company's sanders because of its adjustability and ability to alternate between two unique sanding modes. Perfect for the woodworker looking to tackle a variety of tasks. 6.5 amp motor that can vary speeds between 3,100 and 6,650 ORBITS PER MINUTE. Choose between two different sanding modes for fine detailing and smoothing out, or taking down heavy stock. Soft start function and Pad Dampening System help eliminate swirl and scuff marks leaving you a perfect finish. The ROS65VC-6 is an ideal machine for working on consistent and long-term projects. The focus on usability and comfort mean that you can sand longer without having to worry about fatigue. Exclusive suspension system helps to minimize vibration and increase control and comfort during use. 3.3 amp motor can run between 5,500 and 12,000 orbits per minute and is easily adjustable via the variable speed dial. Soft grip handles and several equally comfortable spots to hold onto. This basic product from Skil is a good random orbital sander for someone looking for their first sander or who doesn't need as much versatility as the higher end models provide. 2.8 amp motor that runs at a fixed speed of 12,500 orbits per minute. Pad break minimizes scuff and swirl marks. This question depends entirely on your short- and long-term needs. Smaller random orbits with fewer bells and whistles can be perfectly fine for some homeowners who will only need to perform a little bit of stock removal and some smoothing out on occasion, while carpenters, cabinet makers, and other heavy use woodworkers will likely require a tool that can perform consistently at a variety of speeds comfortably and over a long period of time. In order to determine which orbital sander will be best suited for your specific needs, it’s important to consider many different factors including the frequency and intensity of use, the scale of projects, the diversity of work to be done, and the experience level of the woodworker. Hopefully, our reviews are a good jumping off point for figuring out which random orbit sander is best for your woodworking needs. First off, let’s get the difference between orbital sanders and random orbital sanders out of the way. There’s a tendency to just lump random orbits in with the orbital sanders, but they are unique machines with a lot of key differences between them. While regular orbital sanders spin in a consistent circular pattern, a random orbit sander does just what its name suggests. Random orbitals randomize the pattern in which the sanding pad moves in order to eliminate the dreaded swirl that simple electric sanders can inflict on your woodwork. It does this by running two separate operations at the same time. While the random orbit sander vibrates in a circular motion just like an orbital sander does, the circular pad spins along its main axis at the same time, which causes a random pattern. This randomized pattern is important for minimizing scratches and creating a more uniform surface. The other main, and most easily noticeable, the difference between orbit sanders and random orbits is that orbit sanders have a square sanding pad, while random orbital sanders have a round pad, with generally a 5-inch or 6-inch diameter. This round pad doesn’t allow the sander to get into corners with the same ease as a square pad would, and it won’t remove wood as quickly as a belt sander, but it does offer more versatile, portable performance, and generally a more user-friendly operating experience. To operate a random orbital sander, you generally don’t have to do much more than affix a sanding pad to it, plug it in, turn it on and then apply the machine with appropriate and even pressure to the surface to be worked on. Of course, that’s just the most basic of instructions. We recommend, as always, to follow the instruction manual that comes with your pad in order to obtain more specific information and instructions about operating your sander. Every machine is a little bit different and will operate a little bit differently. also, you will find orbit sanders have different size motors and different range of speeds. All of the sanders included in our reviews are capable of performing a variety of woodworking tasks. While, there are certainly some that are better suited for specific jobs, or that are built to handle more demanding long-term usage others won’t be able to handle, these are all quality power tools. Our pick for the best orbit sander is the Bosch ROS20VSC, but that could change depending on what you need short- and long-term in a sander. Hopefully, you’ve found our reviews helpful and are that much closer to finding the best random orbital sander for you. It’s easy to see why The Bosch ROS20VC Random Orbital Sander is the top pick from amongst the many sanders included in our reviews. It offers professional power and the capacity to finish your most important wood-working and other sanding projects to the highest possible standard. This model was designed specifically with your finished product in mind, and that emphasis makes for a machine that’s as polished as your work will be. Features like a pad dampening system and a soft, pliable microcellular backing pad help to ensure a perfect finish, while a 2.5 amp motor and variable speeds between 7,500 and 12,000 orbits per minute make sanding quick and efficient. 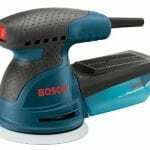 This sander does everything that you would want a random orbital sander to do — the Bosch offers all the standard features of in-class competitors — but it does so at an incredibly reasonable price. Ringing in at only $75, while this isn’t the cheapest sander we’ve looked at in our reviews, it’s certainly a serious contender for the best deal out there. Thanks to its ease of use, and an emphasis on exactly what likely using your sander for– the finishing touch — the Bosch is our top pick for best random orbit sander. What’s great about Festool’s Rotex RO 150 is that, not only is it our top pick for a powerful, premium model, but that it competes so admirably against more refined sanders on fine sanding jobs as it does against its heavy-duty classmates. It is, of course, one of the top, heavy duty sanders on the market: The RO 150 weighs in at 8 pounds and boasts a 200-watt engine capable of running an orbit at variances between 5,000 and 14,000 ORBITS PER MINUTE. But, because of its dual mode system that allows you to switch between aggressively tackling coarser needs, fine sanding, and polishing your projects, the RO 150 is also a versatile master of many trades. This sander is built with the primary goal of providing maximum versatility (click here for the all in one option) and quick, easy adjustability to your wood working. It’s capable of handling the heavier projects you would expect from sanders of its size, but it can also tone it down when the need arises. Not only that, FastFix tool-free backing pad change and stepless variable speed control make adjustments simple and quick. Why spend time fine tuning your sander that ought to be used fine tuning your work? For our best orbit sander Great Value pick, we’ve gone with the BDERO600. This is a no-nonsense budget machine that does everything you would hope a fixed speed random orbital would do. While other sanders may come adorned with more power and features, this Black & Decker model takes a simpler approach. For most people, who are just looking to buy a tool to use around the house, those other machines can bring a lot of unnecessary features to the table, but this little sander is all you need to fulfil your basic sanding needs. It’s light, compact, smartly designed, and capable of performing to the standard you would expect from Black & Decker. User friendly features like an ergonomic design, and a high-performance dust collection system make the sander easy to use comfortably and safely. Match all of that with an outrageous affordable price, and the BDERO600 is an easy pick for the best budget random orbital sander. There are other great budget models we’ve reviewed, such as those from Porter Cable and Skil, but this sander brings a lot of the same basic standards in a neat little package at the lowest price possible. We hope you enjoyed our article on "The 9 Best Random Orbital Sanders", if so, please share and rate it. DEWALT DWE6421K Random Orbit Sander Kit, Great product, very powerful, really light to use and a great tool to have at home.